Transposon, also called transposable elements (TE) is one kind of mobile genetic elements (see other MGEs: http://en.wikipedia.org/wiki/Mobile_genetic_elements). Class I (Copy and Paste): Retrotransposon, which follows DNA-->RNA-->DNA. The DNA itself is transcribed into RNA (like a normal gene), then the RNA is reverse transcribed (by a reverse transcriptase) back to DNA, which is inserted into a new position in the genome. This is like the retrovirus, e.g. HIV, which retro-transcribes its RNA into DNA and merged with host cell's genome, then transcribe into new RNA and effects other cells. LTR-retrotransposon: LTR is the short name for "long terminal repeat", which represents hundreds or thousands of times of a DNA sequence. They can encode reverse transcriptase, acting like a retrovirus. Human endogenous retrovirus (ERV), which account for 8% of human genome, belongs to this catagory. SINE (Short INterspersed Elements): short DNA sequences (<500nt). Don't encode reverse transcriptase itself and can transposition only with help of other mobile elements. SINEs usually look like DNA copies made by Pol3-encoded small RNAs e.g. tRNA, 5S rRNA etc. The most abundant repeat in human genome, Alu, is also classified into SINE. Class II (Cut and Paste): DNA transposon. Its movement does not generate RNA intermediate, but directly mediated by "various types of transposase enzymes", either via a sequence-specific binding or non-specific binding. Around 42% of the human genome is made up of retrotransposons while DNA transposons account for about 2-3%. 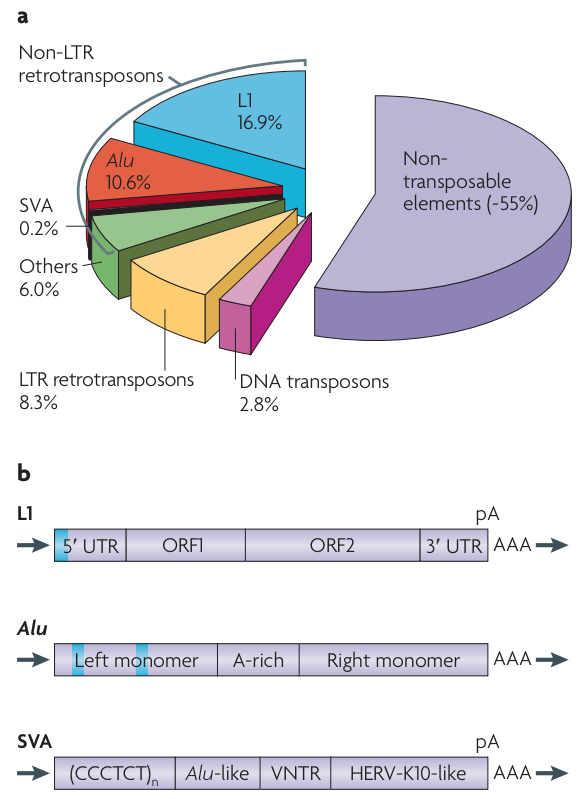 Here is a figure to show the transposable element content of the human genome (Nat. Rev. Genetics 2009, Richard Cordaux and Mark A. Batzer), where SVA is "an element that is made up of a short interspersed element (SINE) region, a variable number of tandem repeats (VNTR) region and an Alu-like region." Are the RNAs transcribed from retrotransposons also exported to cytosol or just stay inside of the nucleus? Are the locations of retrotransposon in genome largely fixed or varied between different cells/individual (non-cancer)? Is the retrotransposon-copied-DNA inserted into the host genome in a random manner or only at specific locations (e.g. decided by sequence features)?